Marine officials have recently announced that the Corps is considering changing its slogan, "The Few. The Proud. The Marines." according to Lieutenant Colonel John Caldwell, a spokesman for Marine Corps Recruiting Command. "'The Few, The Proud' does a great job distinguishing ourselves from the other branches and making us prestigious to recruits, but it doesn't say anything about what we do or why we exist," Caldwell told Marine Corps Times. "We believe the new campaign products require a unique tagline to achieve the effort's objectives." According to Caldwell, the new advertising campaign will show how the Marine Corps is different from the other service branches and reinforce "the elite—almost spiritual—standards the nation has for Marines," Caldwell said. The Marine Corps has been known for their recruiting slogans dating back at least a century to "Tell That To The Marines." Other well-recognized taglines include "We Don't Promise a Rose Garden," "The Marine Corps Builds Men" and "The Change is Forever." 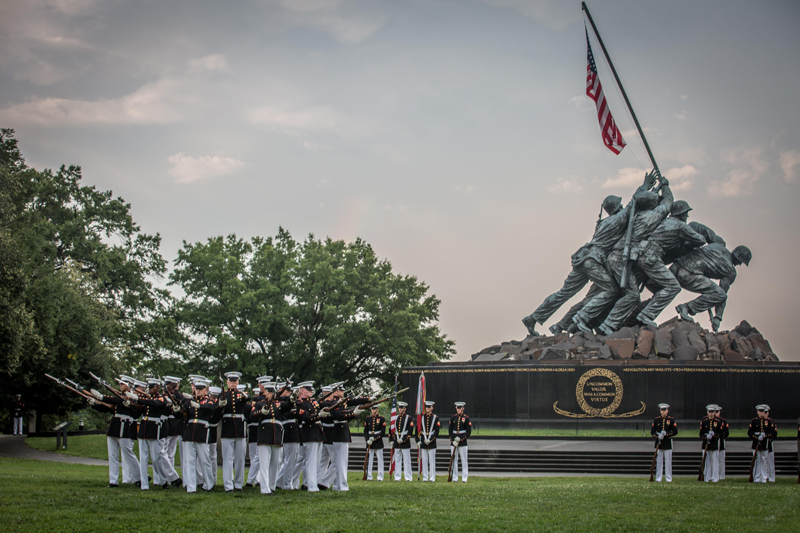 The Sergeant Major of the Marine Corps, Ronald L. Green, hosts a Sunset Parade at the Marine Corps War Memorial, Arlington, VA., June 28, 2016. The parade's Guest of Honor was Dr. Rory Cooper, and included performances from the Marine Drum and Bugle Corps and the Silent Drill Platoon.